Solarea Beach Resort is the most Exclusive Resort Community in Palmas del Mar, located off of Punta Candelero in the southeastern coast of Puerto Rico. 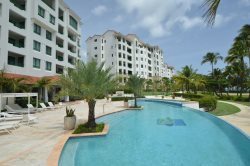 The re/envisioned Solarea Beach Resort, introduces the Sol Lifestyle at Palmas Del Mar. A unique blend of uber private landscapes off of Punta Candelero with lofty new age Mediterranean villas manifest the true tropic nature only Palmas can provide.